I think it's time for a good news story. This one is about a public middle school in San Francisco. Over the past four years, a strong principal and dedicated staff helped a troubled urban middle school move toward success. The school is classically California, so the story of what happened here is valuable. This is a school of about 500 students in grades 6 through 8 where 78.3 percent of students are socio-economically disadvantaged and 26 percent are learning English. It's a very diverse school — rating 57 on the California Diversity Index. About an eighth of the students are African American. About a third are Latino, a quarter are Asian, 7% are Filipino and the list goes on from there. The school is classically California, so the story of what happened here is valuable. Below is a “before and after” chart showing what happened to “referrals” over the past 6 years. A close look shows a significant drop starting in 2015-16. In the green box above, the label "SEL" stands for Social-Emotional Learning, which was a focus of the school's response strategy. 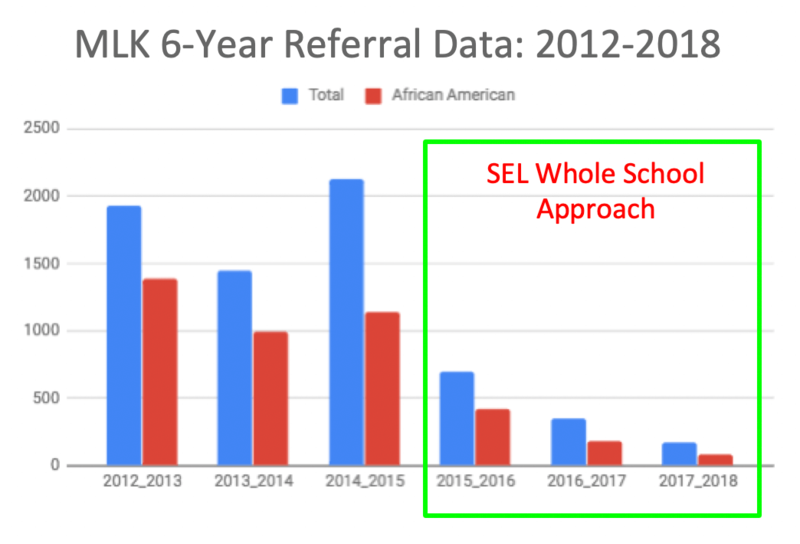 "Referrals" at the school had been concentrated among the school's African American students (about an eighth of enrollment). Principal Essien concluded that the most effective approach would be to address the underlying issues with changes to lift up the whole school. The school leadership team looked closely at the data — referrals by each teacher — and responded. With support from the school district's experts on behavior, they developed new training for teachers to identify effective approaches to keep students on track and address behavior issues. They developed new opportunities for student engagement. They expanded the curriculum to integrate the arts. And they thought deeply about the relationships between students and teachers, putting student needs at the center of decisions. 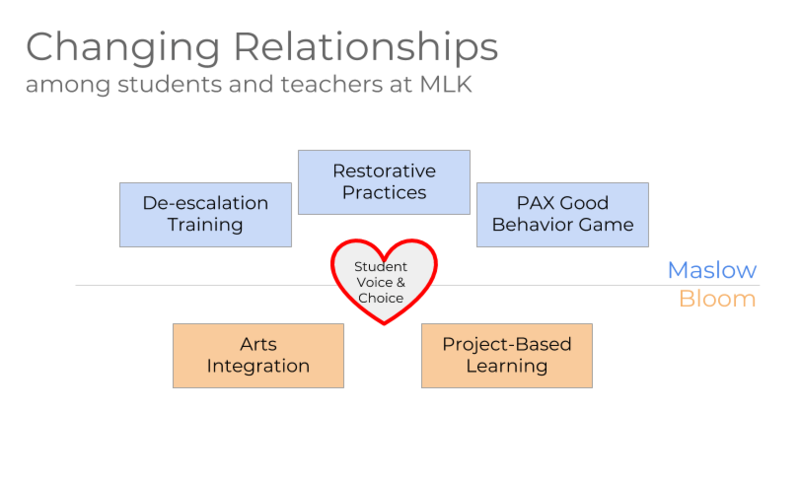 The changes at MLK reflect deep thinking about student needs. They were designed to incorporate the research and thinking of Maslow and Bloom, important thinkers on the subject. Jennifer Hogan, an education commentator who influenced the vision at MLK, argues that to flourish (as described by Bloom), students first need to have their basic needs met (as described by Maslow). Keep kids in class. Teachers don’t send kids out of the classroom. This is a BIG change. Instead, they call an administrator or counselor who comes into the class to help the student get re-focused on the lesson. Use the PAX game. The school now uses the PAX Good Behavior Game to help students make decisions and help teachers reduce bias. Students learn how to work together as a team and how to regulate their own behavior. It helps students pay attention and lets students earn non-material activity incentives for positive behavior in class. The video below shows the game in action. Student conflict resolution. The school also gives students chances to discuss and solve conflicts and issues. For example, they can create a Powerpoint presentation to explain how to get to better behavior, such as “How not to be tardy.” Some students also participate in a Peer Resources class where they learn how to solve conflicts and help other students through mediation. Changing Instruction. The school now emphasizes more student engagement and critical thinking in the way it conducts classes. Teachers have added more student projects and more sharing of personal experiences. Teachers ask students to bring their own expertise to their work. Arts Integration. New arts integration teachers were added to the school staff. They help teachers use the arts to engage students and amplify lessons in core subjects like science, math, social studies and language arts. Listen to an interview by Carol that explains how arts integration works at MLK. 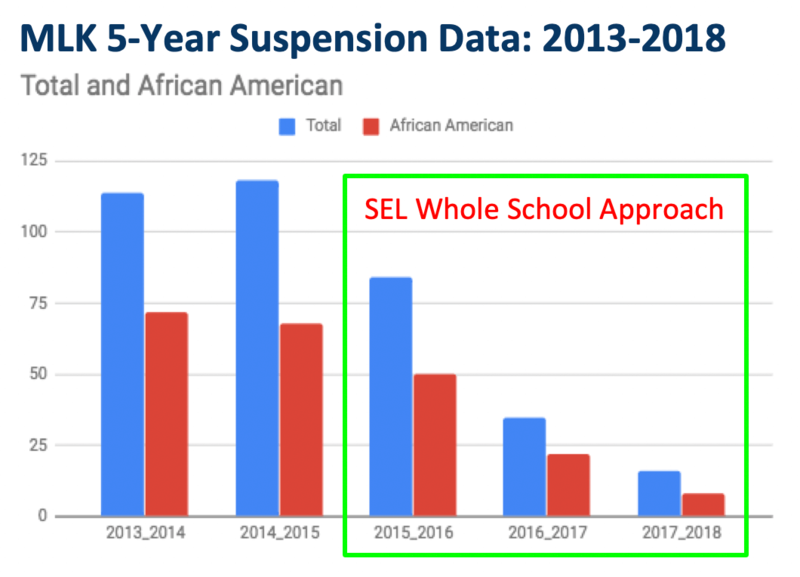 Suspensions have declined substantially at MLK Middle school, for all students and for African American students in particular. 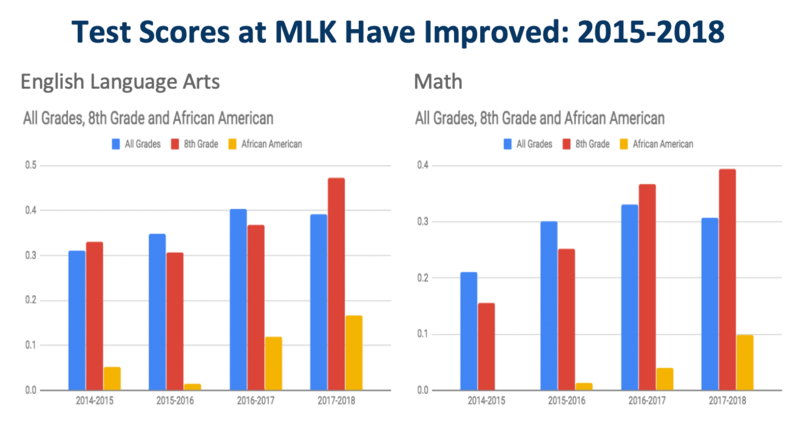 Test Scores have improved dramatically at MLK Middle School in both math and English language arts over the past four years, especially for African-American students. Learn more about the improvement at MLK Middle School in Carol's interview with Michael Essien on KALW radio. Asi como esta exitosa idea, existe alguna que contemple un plan de retroalimentacion de las matematicas entre high school y middle dentro de algun distrito y que sea exitoso? Hago esta pregunta porque en el mio produce molestia cuando la hago, lo mismo ocurre si pido mas consejeros bilingues.